We love reading your YTA training course reviews and these two latest ones are no exception. Thank you. 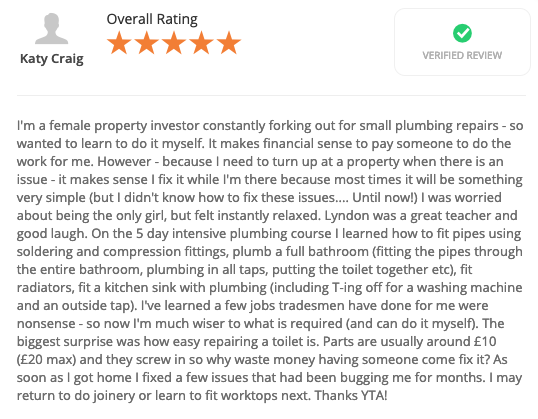 I’m a female property investor constantly forking out for small plumbing repairs – so wanted to learn to do it myself. It makes financial sense to pay someone to do the work for me. However – because I need to turn up at a property when there is an issue – it makes sense I fix it while I’m there because most times it will be something very simple (but I didn’t know how to fix these issues…. Until now!) I was worried about being the only girl, but felt instantly relaxed. Lyndon was a great teacher and good laugh. On the 5 day intensive plumbing course I learned how to fit pipes using soldering and compression fittings, plumb a full bathroom (fitting the pipes through the entire bathroom, plumbing in all taps, putting the toilet together etc), fit radiators, fit a kitchen sink with plumbing (including T-ing off for a washing machine and an outside tap). I’ve learned a few jobs tradesmen have done for me were nonsense – so now I’m much wiser to what is required (and can do it myself). The biggest surprise was how easy repairing a toilet is. Parts are usually around £10 (£20 max) and they screw in so why waste money having someone come fix it? As soon as I got home I fixed a few issues that had been bugging me for months. I may return to do joinery or learn to fit worktops next. Thanks YTA! YTA offer construction courses from taster day’s, fast track 5 & 10 day Cskills level 1 courses up to NVQ level 2 & level 3 advanced craft. Please keep your reviews coming in, we love to read them. If you are looking at booking a course then please email info@ytatraining.com or call the office on 01274682199. YTA Training and Assessment is located in Bradford, West Yorkshire.